Tapan Bandyopadhyay is a prominent Bengali writer of West Bengal. His free travel in many branches of literature including poems, storie, article, novel. 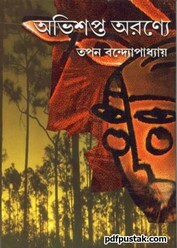 The author has already occupied a prominent place in Bangla literature for his creation 'Goenda Gargi'. He also wrote many notable books as 'Amlagachhi', 'Lalphite', 'Nadi Mati Aronya', 'Buri Shivtalar Kothokota', 'Rupkotha Fire Ase', 'Dwoirath' etc. Now I want to share with all my beloved readers, another popular book of his written- 'Abhishapta Aranye' as pdf file.